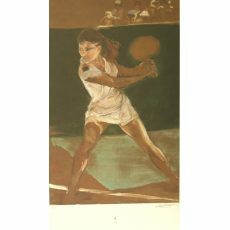 Friedman was commissioned to create a piece for the 1992 Olympic Tennis Team for the Barcelona Games. 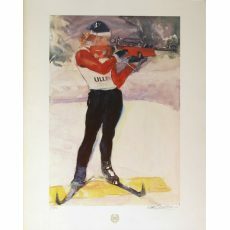 Also she was commissioned to paint the Biathlon for posters and limited edition prints for the 1994 Lillehammer Olympic Games. Dian R. Friedman, formerly of Old Westbury, Long Island, lives in New York City. She was graduated from Syracuse University with a Bachelor of Fine Arts. Dian entered the university as a pre-med student and majored in science, but largely through the influence of Dr. M. Peter Piening, changed her course of study to art. The pre-med courses gave Friedman a vital understanding of the structure of the human form at a time when such knowledge was often de-emphasized in art schools. Her mastery of the art of figure drawing and portraiture enables her to convey vividly the physical movement and emotional expressiveness of her subjects. Eschewing abstraction, she uses her vigorous, searching line to capture the body in motion and the soul at rest. Whether depicting the graceful power of an overhead smash or the mystery of an introspective mood, Friedman finds the essence of her subject in imagery which excites and moves the viewer. Friedman works mostly in the traditional media of charcoal, graphite, chalk, oils and watercolors which she mixes freely on a variety of surfaces, including linen, masonite, corrugated board and paper. She also works in fresco, a technique which suggests the Florentine Renaissance influence evident in her drawing and her use of earth tones. She has received worldwide recognition as an extraordinary artist. With such accomplishments as Purchase of The Steeplechase by the Museum of Modern Art (1971); Gold Medal of Excellence for Virginia Slims Tennis Tournament – Landmark Series awarded by New York Art Director’s Club (1977); the 12 State Collections presented by Phillip Morris (1977); Twenty Awards of Excellence for Pro:files The Great Graphic Innovators by the New York Art Director’s Club (1977); Award of Excellence for portrait series commissioned by U & Ic (1981); Art as Journalism presented by Sports Illustrated Award for artistic reportage of the Virginia Slims Tennis Tournament (1978); Award of Merit at the annual exhibition of the National Academy of Design (1991); Elected a Fellow of the Royal Society of Art, London (1991); Musei Vaticani – Contemporanea commissioned in 1992 to complete a portrait of His Holiness, Pope John Paul II and is on display in the Vatican Museum.